No scriptural proof-text in God’s Word more clearly points to the first of the two phases of Jesus Christ’s second coming than does the following: “For yourselves know perfectly that the day of the Lord so cometh as a thief in the night” (1 Thess. 5:2). We who hold to the pre-trib rapture viewpoint are often accused of being deceivers. We are condemned by our detractors as leading astray Christians alive now–if they live to see it-- who will be required to endure the tribulation, thus to wash their robes clean in preparation for inheriting God’s Kingdom. We are castigated for foisting upon innocent, gullible believers a “secret rapture” that will somehow lead these Christians to take the mark of the beast (Rev. 13:16-18). I’m not precisely sure of their “reasoning,” but I think they claim this because they are convinced that the ones who fall for the rapture viewpoint won’t be able to recognize Antichrist when he comes to power. We who teach the pre-trib rapture, so the accusation goes, would have falsely led these people to think the Church would not be here when Antichrist is on the world scene. Almost all who are antagonistic to the pre-trib rapture doctrine teach that the “elect” will have to endure part or all of the seven-year tribulation era. Those who hold to a post-tribulation rapture, or a no-rapture position, believe that Christ will come back at the end of the tribulation, at Armageddon. They hold to the notion that that is His only return in the second coming. There are other views of the second coming that have Christ returning when the earth is perfected and made ready, but we won’t go there in this essay. Let us look at only the pre-trib rapture and the post-trib rapture positions for the purpose of exploring what is meant by the “thief in the night” references in 1 Thessalonians 5:2 and 2 Peter 3:10. These two viewpoints–the pre-trib, and the post-trib--offer the greatest contrast to examine in consideration of the second advent of Jesus Christ, within the overall belief that rapture will, according to Bible prophecy, happen before Christ’s foot actually touches down on Planet Earth. The pre-trib view of rapture says that Christ’s second coming is in two phases, separated by at least seven years. The post-trib rapture view says that the rapture and Christ’s coming back to the Mount of Olives will occur almost simultaneously–certainly with no more than a matter of days separating the two events. The post-trib position says there is no “secret” rapture. Christ’s coming again will be fully seen in the heavens by all, including Christians who will be watching for Him to break through the darkness of that hour. We agree that the rapture of the Church (all born-again believers in Jesus Christ for salvation since the Church Age began at Pentecost will be anything but a “secret”. The world will instantly go into cataclysmic chaos at the moment that stunning event takes place. The imagination is hard-pressed to fathom the ramifications of what will happen when millions suddenly vanish. Every child below the age of accountability will be gone in that mind-boggling instant of time. All babies (including those in the wombs of their mothers) will be instantly in the presence of Christ in the clouds of glory. Every corpse of every dead Christian will be raised to join with his or her soul to meet Christ in the air in that atomos of time. The rapture will be mystifying, and to some an inexplicable phenomenon, but it will not be a secret. It will happen before the eyes of a stupefied planet of left-behind earth-dwellers. This declaration that Jesus will call His Church to be with Him seems audacious to many. But, it didn’t seem so to the Apostle Paul. He was quite confident–even adamant—in his prophecy concerning the “mystery” he had been given by the Holy Spirit to instruct all believers down through the Age of Grace (Church Age). In a moment, in the twinkling of an eye, at the last trump: for the trumpet shall sound, and the dead shall be raised incorruptible, and we shall be changed” (1 Cor. 15:51-52). He explains what will take place next, in that stupendous fraction of a second: “For this we say unto you by the word of the Lord, that we which are alive and remain unto the coming of the Lord shall not prevent them which are asleep.For the Lord himself shall descend from heaven with a shout, with the voice of the archangel, and with the trump of God: and the dead in Christ shall rise first: Then we which are alive and remain shall be caught up together with them in the clouds, to meet the Lord in the air: and so shall we ever be with the Lord” (1 Thess. 4:15-17). Jesus himself told of this “mystery” Paul refers to in 1 Corinthians 15:51. The Lord explains what happens after believers –both the bodies of the dead and those who are living-- are caught up in the air to be with Him: “Let not your heart be troubled: ye believe in God, believe also in me. In my Father's house are many mansions: if it were not so, I would have told you. I go to prepare a place for you. And if I go and prepare a place for you, I will come again, and receive you unto myself; that where I am, there ye may be also” (Jn. 14:1-3). So, the rapture will take place. Believers and the bodies of those who died during the Church Age will be “caught up” in one single moment of time. “ALL,” not “some,” will go instantly to be with Jesus, who will then take them into heaven, where He has been preparing their dwelling places since He ascended from the Mount of Olives. The pre-trib view holds that it will occur at an unknown time. It will be a stunning, sudden, and unannounced-to-the-world-at-large break-in upon business as usual on Planet Earth. The post-trib proclaims that it will occur following all of the horrors of the judgments outlined in Revelation. The pre-trib view says that the world at large (left-behind earth-dwellers) won’t see it coming. The rapture will cause all left on earth to wonder what has happened. The post-trib view says that all eyes will behold Christ’s coming again to a hellish planet, and the living and dead saints will then be gathered to Christ. 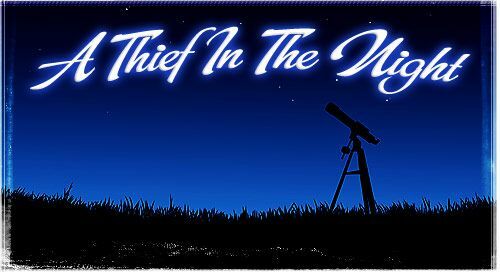 The defining thing to consider in thinking on the two diametrically different views of the rapture and second coming is wrapped up in the term “thief in the night”. The Apostle Peter again uses this mysterious term, first used by Paul in 1 Thessalonians 5:2: “But the day of the Lord will come as a thief in the night; in the which the heavens shall pass away with a great noise, and the elements shall melt with fervent heat, the earth also and the works that are therein shall be burned up” (2 Pet. 3:10). This description hardly fits the post-trib view, or any other view that says Christ will rapture His Church during a time of unprecedented trouble (Jer. 30:7; Matt. 24:21). This indicates that it will be a total surprise, because a thief in the night doesn’t announce his coming with great, cataclysmic fanfare. The break-in is swift, stealthy–a totally unexpected event. Peter foretells in these passages that the “day of the Lord” will then run its course, until the remaking of the heavens and the earth. The rapture will begin this “day of the Lord,” which will then run at least 1,007 years. This is the first phase of Christ’s second coming. The rapture occurs like a “thief in the night”. The second advent, when Jesus’ foot touches down on the Mount of Olives, is the second phase of His second coming. There are those who say with vehemence that it is blasphemous to equate Christ’s coming again as being like the break-in of a thief in the night. How dare we liken their Lord to a “thief”! “But know this, that if the goodman of the house had known in what watch the thief would come, he would have watched, and would not have suffered his house to be broken up. Therefore be ye also ready: for in such an hour as ye think not the Son of man cometh” (Matt. 24:43-44). Looks like a pretty good case for the Lord’s sudden intervention into the nefarious affairs of this increasingly wicked world, does it not? That thief-in-the-night moment could happen, literally, at any moment. Certainly, signals of the tribulation are beginning to come to pass. “And when these things begin to come to pass, then look up, and lift up your heads; for your redemption draweth nigh” (Lk. 21:28).